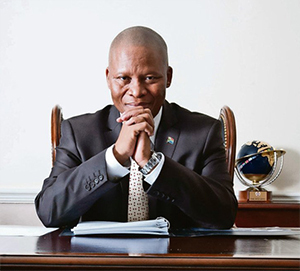 Chief Justice Mogoeng Mogoeng has been appointed Chancellor of the University of KwaZulu-Natal. The Chancellor is elected by Council and holds office for a period of four years. The Chief Justice is the third Chancellor to hold this office at the University. He succeeds Dr Zweli Mkhize who served two four-year terms of office. Dr Frene Ginwala who was appointed in 2005, served as the first Chancellor of the University. In terms of the University Statute the Chancellor is the titular head of the University and presides over all congregations and in particular, he confers all degrees and awards all diplomas and certificates at graduation. He will also perform such functions as assigned to him by the Council of the University. The tenure of the Chancellor may not exceed two consecutive terms of office. Chair of Council, Rev Dr Vukile Mehana welcomed the appointment of the new Chancellor. He said the University was indeed fortunate to have the eminent Chief Justice serve as Chancellor and we look forward to interacting with him in this critical role. He also thanked his predecessor Dr Zweli Mkhize for his distinguished service to the University. Chief Justice Mogoeng is the fourth Chief Justice of the Republic of South Africa. He holds the B Juris and Bachelor of Laws (LLB) degrees from the Universities of Zululand and Natal respectively. He also holds a Master of Law (LLM) degree from the University of South Africa. The Chief Justice started his professional career as a temporary interpreter and was later appointed as High Court prosecutor from March 1986 to February 1990 in Mafikeng. He did pupillage at the Johannesburg Bar and practised as an Advocate at that Bar from June 1990 until the end of 1991. He left to join the Mafikeng Bar from January 1992 and later served as the Deputy Chairperson of that Bar Association until he was elevated to the Bench. In June 1997 he was appointed a Judge of the North West High Court and in April 2000 a Judge of the Labour Appeal Court. In October 2002, he was then elevated to the position of Judge President of the North West High Court. In 2009, he was appointed to the Constitutional Court of the Republic of South Africa and was subsequently elevated to the position of Chief Justice in September 2011. He also chairs the Judicial Service Commission (JSC), South African Judicial Education Institute (SAJEI) Council and National Efficiency Enhancement Committee (NEEC). He is also one of the Vice Presidents of Conference of Constitutional Jurisdictions of Africa (CCJA).